Imagine you are planning to go camping and the idea of campfire cooking gets you a little intimidated. Campfire cooking sounds less appealing to many people. It is hard considering you are leaving your oven and cook-top at home. Camping is a good way to relax and avoid the usual hustle and bustle of day to day activities. You need not to be anxious as this article will make you understand that campfire cooking is safe, fun and easy as long as you plan ahead. It is important to carry the right equipment depending on the type of food you intend to prepare. Dry wood is ideal for cooking; do not use green wood to avoid smoke that will pollute the atmosphere. You can purchase dry wood from the local general store, you don't want to risk by assuming you will find some at the camp site. Locate the fire far away from trees and loose dirt. You don't want to cause a fire. If you find a fire pit at your camping site it will be an advantage for you, if not you have to create on. Take well rounded rocks and arrange them into a "U" shape, if it is windy you can place a huge rock in the direction of the wind to avoid blowing off of fire and wastage of wood. If you want to learn more about Campfire Cooking, you can visit https://en.wikipedia.org/wiki/Campsite#Backcountry_camping . In addition, plan your meals early enough, measure the necessary ingredients before you leave for your camping trip. 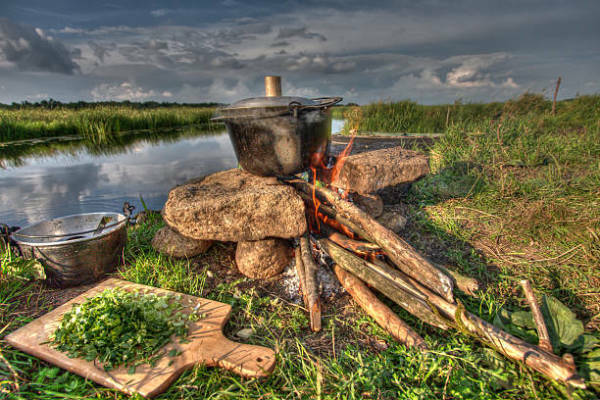 A Dutch oven is the most popular campfire cooking equipment because it is large and thick which means it can be used as a serving bowl for camping groups. It is crucial you carry metallic utensils since plastic can burn. With the right equipments, it is so easy to cook a variety of different foods. You can use hardwood coals to toast bread and meat to have a grilled taste. Avoid cooking drippy fatty foods as they may cause flare ups, click here to get started !